How did people think about stone adzes, the collection of raw material and quarries in Stone Age Norway? Could there be reasons beyond required qualities needed for making certain tools that made people quarry and distribute certain rocks? Can we tell by the volume of exploitation and scale of distribution and use whether stone from some places was considered more valuable than others? Flint is the most commonly used raw material in many countries, as in Norway. However, there is no flint in Norwegian bedrock. Instead, nodules of flint had been redeposited with the help of ice-water and ice during the Ice Age. When the glaciers melted, ice that had covered areas with flint deposits further south broke loose and floated west and north with flint stuck to them. They stranded at the shores, melted, and made the sloping shores of the Norwegian coast treasure chests for Mesolithic and Neolithic raw material hunters. Hence also the colloquial name “beach flint”. However, after the first two thousand years of settling along the Norwegian coast, something stirred in these societies. Some researchers suggest that mobile hunter-gatherers did not only move in from the south-east, but now also came from the north-east (e.g. Sørensen et al. 2013; Damlien 2016). This may have caused the apparent changes in tool types and the way one made them. Beach flint was no longer sufficient for making adzes. After 8000 BC, adzes were roughly shaped by knapping, and then ground into their final shape (Figure 1). Figure 1. An example of the new type of greenstone adze made after 8000 BC in South Norway. (Photo: Astrid J. Nyland). At this point in time, quarrying began. At first, a few sources were probably exploited repeatedly as a predictable supply of high quality rock. However, as millennia went by it became clear that a few sites must have come to mean more to the people that used them, than simply being sources of rock. An indication of significance beyond pragmatics may be the ‘refusal’ to abandon these quarries, even as the rock deposits were partly submerged by a transgressing sea, making other deposits more accessible. Over time, the quarries on the western coast of South-Norway developed into the most monumental human-made sites of the Norwegian Stone Age that we know of. These are a diabase quarry at Stakalleneset in Flora, Sogn og Fjordane County (Figure 2), and the Hespriholmen greenstone quarry at Bømlo, Hordaland County (Figure 3). Figure 2. Left: A massively exploited diabase dike at Stakalleneset, Flora, Sogn og Fjordane County. Right: Blanks, used knapping stones and waste of diabase found at the foot of the quarry. (Photo: Astrid J. Nyland). Figure 3. 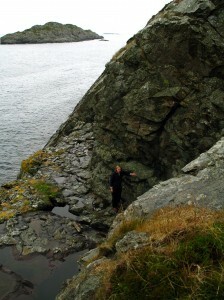 The greenstone quarry Hespriholmen on an islet in the sea outside Bømlo, Hordaland County. (Photo: Astrid J. Nyland). These quarries were exploited from around 7500 BC to 2500 BC, and around 400 m3 were extracted. Hence, during more than 4000 years, the hollows and scars in the rock phase and tailing piles grew ever larger. The diabase and greenstone were distributed widely, but each type within a demarcated area that probably defined a social territory (Olsen and Alsaker 1984). These quarries were not the sole providers of rock for adzes, but the particularities of the exploitation of these sites indicate that they gradually turned into social nodes too. In the Norwegian Stone Age, enduring man-made structures of stone were rare as most things were made of degradable materials. By the end of the Mesolithic, before 4000 BC, the mentioned quarries displayed deep scars and large waste piles that persisted for generations. In ethnographic books, there are several examples of specific places being bestowed with social or symbolic meaning and power. Places can be related to origin myths or tales of other significant events in a society. In the case of the prehistoric quarries, there might have been value in the mere continuance of the quarrying tradition at a place where one saw solid proof of one’s ancestors endeavours (Nyland 2016a, 2017). Rock associated with these socially significant places would then also have become valued. Perhaps that was one reason for the wide distribution? Dr. Astrid J. Nyland, Associate Professor, Museum of Archaeology, University of Stavanger, Norway. 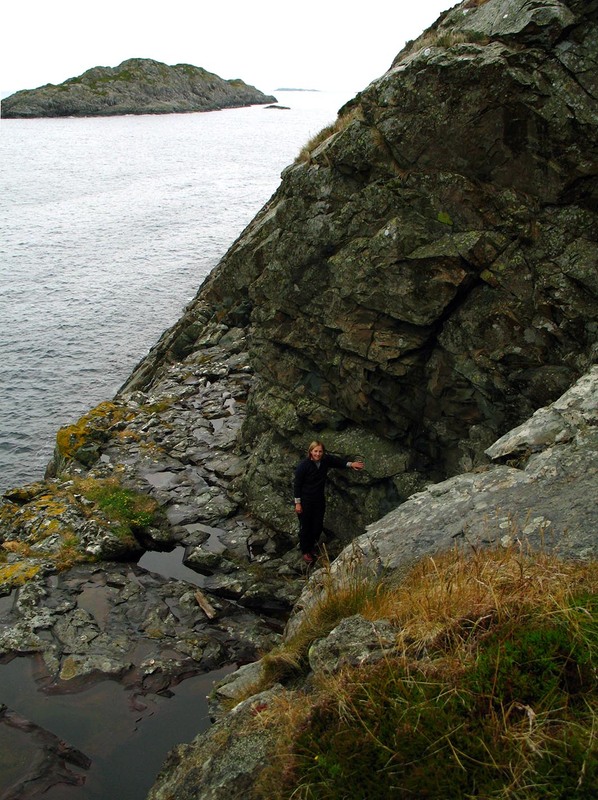 (Nyland has written a PhD (2016) about 21 quarries of various types of rock, located both at the coast and in the mountains, dating to the Stone, Bronze and Early Iron Age in South-Norway. The results that this blog post builds on have been published in several articles accessible from her page at academia.edu). Nyland, A.J., 2016a. Humans in Motion and Places of Essence. Variations in rock procurement practices in the Stone, Bronze and Early Iron Ages in southern Norway. Unpublished PhD thesis. University of Oslo. Nyland, A.J., 2017a. Materialized Taskscapes? – Mesolithic lithic procurement in Southern Norway. In: Rajala, U. & Mills, P. (eds.) Forms of Dwelling; 20 Years of Taskscapes in Archaeology. Oxford: Oxbow books, pp. 125–150. Olsen, A. B. and Alsaker, S. 1984. Greenstone and Diabase Utilization in the Stone Age of Western Norway: Technological and socio-cultural aspects of axe and adze production and distribution. Norwegian Archaeological Review 17, 2: 71-103. Sørensen, M., Rankama, T., Kankaanpää, J., Knutsson, K., Knutsson, H., Melvold, S., Eriksen, B. Valentin and Glørstad, H. 2013. The First Eastern Migrations of People and Knowledge into Scandinavia: Evidence from studies of Mesolithic technology, 9th-8th millenium BC. Norwegian Archaeological Review, 46, 1: 19-56. The Hunter, The Dog Men, and the House by the Shore: How an archaeologist writes an archaeological novel.